Former Palmerston North mayor Paul Rieger received one of the University's highest awards at a ceremony at the Palmerston North campus on 30 June. 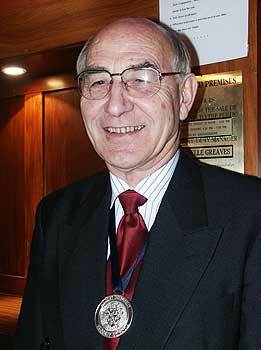 Mr Rieger received the Massey University Medal for his services to the University and the community. Paul Rieger, QSO, JP, is a former member of the University Council and served from 1987 to 2004, for most of that time as a ministerial appointment. He served a term as Pro Chancellor of the Council and chaired the Council's Finance Committee for 10 years before becoming a member of the Audit and Risk Committees. Mr Rieger was a member of the Palmerston North City Council and mayor for a total of 27 years. He served two years as Deputy Mayor and 14 years as mayor, until 1998. In a citation before the award of the Massey University Medal, the head of the Graduate Research School, Professor Ken Milne, said Mr Rieger brought much the same approach to the University Council as he did to the City Council, in particular exhibiting mediation skills, with the ability to diffuse a tense situation by the means of thoughtful comment or jocular remark, or timely interjection. Reflecting Mr Rieger's long association with the University, a large number of present and former staff and Council members attended the ceremony and dinner at Wharerata. Among them were former Assistant Vice-Chancellor (Academic) Graeme Fraser, former Vice-Chancellor Sir Neil Waters and former Council member Jack Dowds.